احمدی, عیسی. (1394). تحلیل تنش‌های بین لایه‌ای در پوسته‌‌های استوانه‌ای کامپوزیتی با لایه‌گذاری متعامد تحت بارگذاری شعاعی. 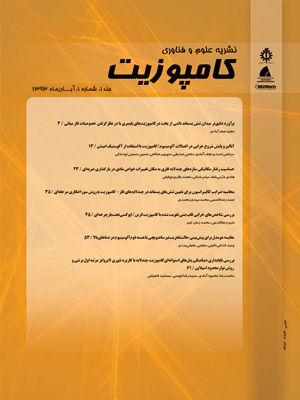 علوم و فناوری کامپوزیت, 2(3), 43-54. عیسی احمدی. "تحلیل تنش‌های بین لایه‌ای در پوسته‌‌های استوانه‌ای کامپوزیتی با لایه‌گذاری متعامد تحت بارگذاری شعاعی". علوم و فناوری کامپوزیت, 2, 3, 1394, 43-54. احمدی, عیسی. (1394). 'تحلیل تنش‌های بین لایه‌ای در پوسته‌‌های استوانه‌ای کامپوزیتی با لایه‌گذاری متعامد تحت بارگذاری شعاعی', علوم و فناوری کامپوزیت, 2(3), pp. 43-54. احمدی, عیسی. تحلیل تنش‌های بین لایه‌ای در پوسته‌‌های استوانه‌ای کامپوزیتی با لایه‌گذاری متعامد تحت بارگذاری شعاعی. علوم و فناوری کامپوزیت, 1394; 2(3): 43-54. هدف این مقاله مدل‌سازی پوسته ‌استوانه‌ای بسته کامپوزیتی و محاسبه میدان تنش، مخصوصا تنش‌های برون صفحه‌ای در پوسته‌های استوانه‌ای کامپوزیتی با طول محدود تحت بارگذاری شعاعی ‌می‌باشد. برای فرمول‌بندی مسئله از تئوری لایه‌ای بر مبنای جابه‌جایی بهره‌گیری شده است. با در نظر گرفتن فرم میدان جابه‌جایی مناسب برای پوسته استوانه‌ای کامل، فرمول‌بندی تئوری لایه‌ای برای مسئله استخراج شده است. ابتدا میدان کرنش پوسته در تئوری لایه‌ای به‌دست آمده و سپس با استفاده از اصل حداقل انرژی پتانسیل کل معادلات حرکت حاکم بر استوانه در تئوری لایه‌ای و شرایط مرزی متناسب برای آن استخراج شده است. معادلات حاکم بر مسئله به تعداد دلخواهی معادله دیفرانسیل کوپل بر حسب توابع جابه‌جایی تبدیل شده است. با تعریف متغیر مناسب، حل تحلیلی برای معادلات پوسته کامپوزیتی متعامد ارایه شده و شرایط مرزی در لبه‌های پوسته اعمال شده است. در قسمت نتایج عددی، پوسته کامپوزیتی متعامد از جنس کربن-اپوکسی با لایه‌گذاری متقارن و نامتقارن که تحت بارگذاری فشار داخلی یا خارجی است بررسی شده است. ابتدا همگرایی تنش‌ها نسبت به تعداد لایه‌های عددی در تئوری لایه‌ای مورد مطالعه قرار گرفته است و سپس توزیع میدان تنش و مخصوصا تنش‌های بین لایه‌ای در نزدیکی لبه‌های استوانه ارایه شده است و توزیع تنش‌های بین لایه‌ای عمودی و برشی در لایه مرزی نزدیک به لبه‌ها مطالعه شده است. ملاحظه شد که لایه‌گذاری تاثیر زیادی در اندازه و نحوه توزیع تنش‌های بین لایه‌ای دارد. همچنین مشاهده شد که اندازه بیشینه تنش بین لایه‌ای عمودی در لبه‌های آزاد پوسته از مقدار فشار داخلی اعمال شده به استوانه بزرگتر است و اندازه تنش بین لایه‌ای برشی در حدود اندازه فشار اعمالی می‌باشد. In this study, the stress field and specially the interlaminar stresses in a composite cylinder with finite length which is subjected to radial load are studied. The displacement based layer-wise theory (LWT) of Reddy is used for formulation and solution of a composite cylinder which is subjected to internal and external pressure. The principle of minimum total potential energy is used to derive the governing equations and the appropriate boundary conditions (BC) for the problem. The governing equations of the problem include a set of coupled ordinary differential equations in the terms of the unknown displacement functions of the mathematical surfaces in the LWT. A set of new variables are defined and the governing equations of the problem are solved analytically. The free edge boundary conditions are considered in the analysis. In the numerical results, the distribution of the interlaminar stresses and in-plane stresses in the symmetric and un-symmetric laminated composite cylinders which are subjected to internal or external pressure are presented. It is seen that the layer stacking has important effect on the distribution and magnitude of the interlaminar stresses in the cylinder. It is observed that the maximum value of the interlaminar normal stresses in the free edge of the cylinder is bigger than the applied radial pressure and the interlaminar shear stress is in the order of the applied pressure. Kant,T. and Swaminathan.K, “Estimation of Transverse/Interlaminar Stresses in Laminated Composites-a Selective Review and Survey of Current Developments,” Composite Struct, Vol. 49, pp. 65-75, 2000. Pipes, R.B. and Pagano, N.J., “Interlaminar Stresses in Composite Laminates under Uniform Axial Extension,” J. Compos. Mater, Vol. 4, pp. 538-548, 1970. Pipes, R.B. and Pagano, N.J., “Interlaminar Stresses in Composite Laminates- an approximate Elasticity Solution,” Journal of Applied .Mechanics, Vol. 4, pp. 668-672, 1974. Pipes,R.B. and Daniel Moire, I.M., “Analysis of the Interlaminar Shear Edge Effect in Laminated Composites,” J. Compos. Mater, Vol. 5, pp. 255-59, 1971. Tang, S. and Levy, A., “A boundary layer theory-part II: Extension of Laminated Finite Strip,” J. Compos. Mater, Vol. 9, pp. 42-52, 1975. Hsu, P.W., and Herakovich, C.T., “Edge effects in angle-ply composite laminate,” J. Compos. Mater, Vol. 11, pp. 422-28, 1977. Wang, S.S. and Choi, I., “Boundary-Layer Effects in Composite Laminates. Part I: Free-edge Stress Singularities,” ASME J. Appl. Mech, Vol. 49, pp. 541-548, 1982. Wang, S.S. and Choi, I., “Boundary-Layer Effects in Composite Laminates, Part II: Free-edge Stress Solutions and Basic Characteristics,” ASME J. Appl. Mech, Vol. 53, pp.744-750, 1986. A.S.D. Wang, F.W. Crossman, “Some New Results on Edge Effect in Symmetric Composite Laminates,” J. Compos. Mater, Vol. 11, pp. 92-106, 1977. Wang, A.S.D. and Crossman, F.W., “Edge Effects on Thermally Induced Stresses in Composite Laminates,” J. Compos. Mater, Vol. 11, pp. 300-312, 1977. Whitcomb, J.D. and Raju, I.S. and Goree, J.G., “Reliability of the Finite Element Method for Calculating Free Edge Stresses in Composite Laminates,” Comput Struct, Vol. 15, No. 1, pp.23-37, 1982. Murthy, P.L.N., and Chamis, C.C., “Free-edge Delamination: Laminate Width and Loading Conditions Effects,” J Comp Technol Res, Vol. 11 No. 1, pp. 15-22, 1989. Cho, M. and Kim , H.S., “Iterative Free-Edge Stress Analysis of Composite Laminates under Extension, Bending, Twisting and Thermal Loadings,” Int J Solids Struct, Vol. 37, No. 3, pp. 435-59, 2000. Shu, X.P. and Soldators, KP, “Cylindrical Bending of Angle-Ply Laminates Subjected to Different Sets of Edge Boundary Conditions,” Int J Solids and Struct, Vol. 37, pp.4285-4307, 2000. Nosier, A. and Bahrami , A. “Interlaminar Stresses in Antisymmetric Angle-Ply laminates,” Composite Struct. Vol. 78, pp.18-33, 2007. Ren, J.G., “Exact Solution for Laminated Cylindrical Shell in Cylindrical Bending,” Composite science and Technology, Vol. 29, pp. 168-187, 1987. Chaudhuri, R.A., “On the Prediction of Interlaminar Stresses in a Thick Laminated General Shell,” Int. J. Solids Struct, Vol. 26, No. 5-6, pp. 499-510, 1990. Kant, T. and Menon, M.P., “Estimation of Interlaminar Stresses in Fiber Reinforced Composite Cylindrical Shells,” Computers & Structures, Vol. 38, No. 2, pp.131-147, 1991. Jing, H.G. and Tzeng, K.G., “Elasticity Solution for Laminated Anisotropic Cylindrical Panels in Cylindrical Bending,” Composite Structures, Vol. 30, No.3, pp.307-317, 1995. Boitnot, R.L. and Starnes, J.H.Jr. and Johnson, E.R., “Nonlinear Response and Failure of Pressurized Composite Curved Panels,” Journal of Aerospace Engineering, Vol. 8, No. 3, pp.129-138, 1995. Shu, X.P., “A Refined Theory of Laminated Shells with Higher-Order Transverse Shear Deformation,” Int. J. Solids Struct, Vol. 34, No. 6, pp.673-683, 1997. Jing, H. and Tzeng ,K., “Analysis of Thick Laminated Anisotropic Cylindrical Shells Using a Refined Shell Theory,” Int. J. Solids Struct, Vol. 32, No. 10, pp. 1459-1476, 1995. Carrera, E., “Multilayered Shell Theories Accounting for Layerwise Mixed Description,” Part1: AIAA Journal, Vol. 37, No. 9, pp. 1117-1124, 1999. Hossain, S.J., “A Finite Element Formulation for the Analysis of Laminated Composite Shells,” Comput. Struct, Vol. 82, No. 20–21, pp. 1623–1638, 2004. Tanov, R. and Tabiei , A., “Adding Transverse Normal Stresses to Layered Shell Finite Elements for the Analysis of Composite Structures,” Composite Struct, Vol. 76, No. 4, pp. 338–344, 2006. Afshin, M. and Sadighi , M. and Shakeri ,M., “Free Edge Effects in a Cylindrical Sandwich Panel with a Flexible Core and Laminated Composite Face Sheets,” Mechanics of Composite Materials, Vol. 46, No. 5, pp.787-808, 2010. Mahmoudabadi, M.R., Ovesy H.R. and Fazilati J., “Dynamic Instability Analysis of Composite Cylindrical Panels Using the First Order Shear Deformation Layerwise Theory and Spline Finite Strip Method, ” In Persian, Journal of Science and Ttechnology of Composites, Vol. 1, pp. 61-74, 2014.